What is the best Kartoffelsalat recipe? 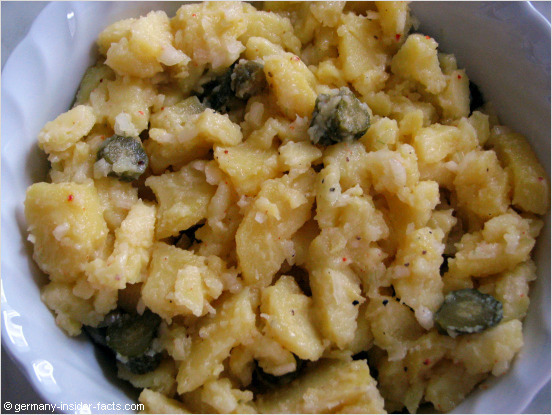 We have more than one authentic German potato salad recipe. After all, Kartoffelsalat is a traditional German food, therefore you will find different recipes throughout Germany. Kartoffelsalat is a favourite side dish of the German cuisine. My favourite potato salad- yes, it is homemade! There is some sort of "war" going on whether traditional German potato salad should be made with mayonaise, or with vinaigrette. People of northern Germany prefer the mayo version, while in the south vinaigrette is used. Of course, there is no "right" or "wrong" answer, it is just a matter what people are used to. When is potato salad traditionally eaten? Kartoffelsalat is a must to have at a grill party! You will find it also on menues at beergardens and at any place that serves short snacks. 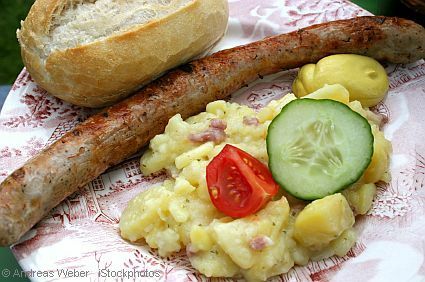 Potato salad goes with all kind of sausages, fish and Schnitzel. In southern regions it is also part of a mixed salad served with a main dish. When I was a kid, we had potatoe salad with sausages on Christmas Eve. This is still common in some families and regions. This is my basic Kartoffelsalat receipe which my husband loves best. The photo above shows the result of this recipe. Wait at least 2 hours until you serve this tasty potato salad at room temperature. You can modify this recipe to suit your taste. Ingredients that harmonise with this recipe are boiled eggs and diced ham. To add more moisture to the salad, use 1/8 l plain broth instead of the tablespoon water for the vinaigrette. The version with bacon is also another favourite. You can serve it warm or cold. If you want to eat the salad warm, cook the potatoes on the same day. Let the salad rest for at least 20 minutes. This is a very rich salad, and it tastes very nice. Modify this recipe with sliced radish, ham or even diced apples. I used to be fairly inventive and added nearly everything I found in the fridge to my potatoe salad. 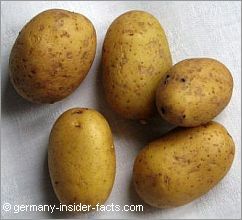 However, these days I prefer a basic and traditional German potato salad recipe. Don't add all the recommended liquids like broth or water immediately. Depending on how moist you want your salad, you can add more later.